Please note that the Pari Trek S Deluxe - with Li-ION Rechargeable Battery is on a manufacturer back order with no ETA. Please order the standard model if you require this device right away. 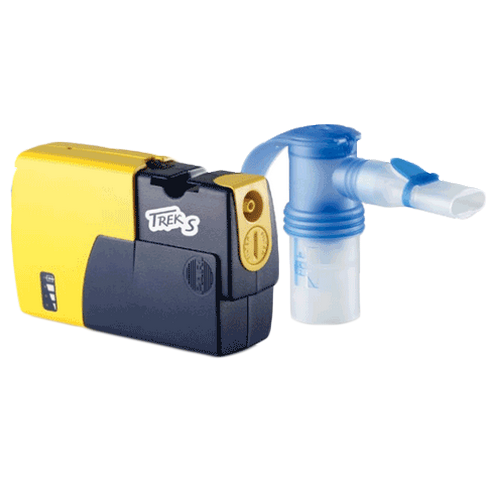 PARI Trek S Portable Compressor Kit provides treatments for nebulizer patients on the go. The PARI TREK S has a lightweight nebulizer design weighing less than 1 pound. PARI TREK S Portable Nebulizer Compressor includes both AC and 12V DC adapters. The 12 volt automobile adapter works with cars or boats. The Deluxe PARI Trek S Portable Nebulizer Compressor model comes with a rechargeable battery which permits patients the freedom to take aerosol treatments away from home. A handy carrying case provides the freedom to take aerosol treatments anywhere, anytime. Equipped with the PARI LC® Sprint reusable nebulizer, the PARI Trek® S delivers powerful performance and shorter treatment times. Included are the patented PARI Wing Tip™ tubing and the exclusive PARI Timestrip® to remind patients to replace their PARI reusable nebulizer. Additionally, the Deluxe Model includes a Li-Ion rechargeable battery. Portable Nebulizer for nebulizer patients on the go. Average treatment time is 5-6 minutes. 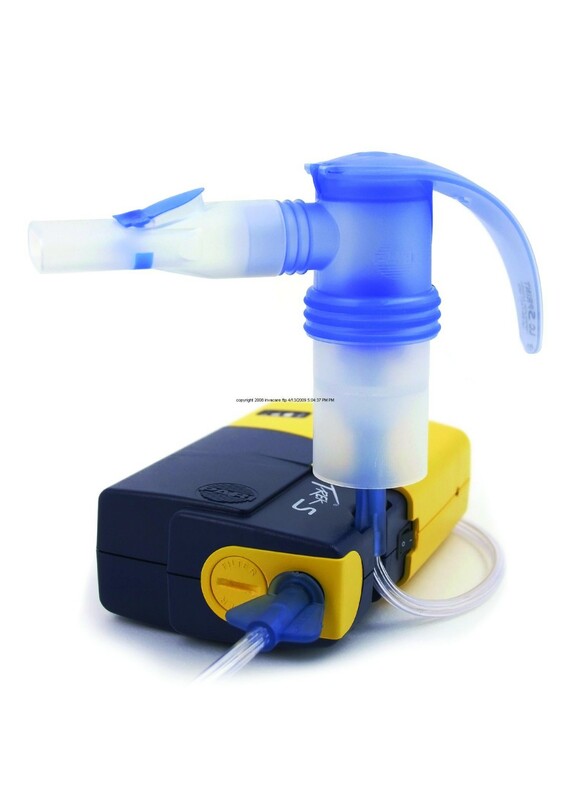 Trek S Nebulizer Product Numbers: 47F35LCS, 47F45LCS. Maximum Air Flow: 8.5 LPM. Maximum Operating Pressure: 35 PSI. Nominal Operating Pressure: 14.5 PSI. Maximum Liter Flow: 8.5 LPM. Nominal Air Flow 4 LPM. Rechargeable Battery Charge Life (Deluxe Model): 50 minutes. Rechargeable Battery Charge Time (Deluxe Model): 2 hours. 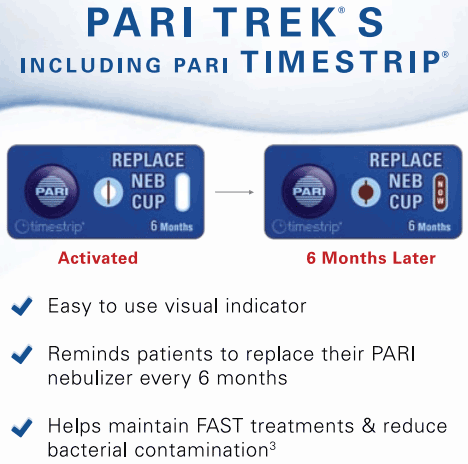 PARI Trek S Portable Nebulizer Warranty: 3 years. PARI Trek S Battery Warranty: 6 months. Home Nebulizer Treatment Study – survey of patients with chronic lung disease. Nebulizer COPD Treatment Study – quality of life improvements for COPD patients. 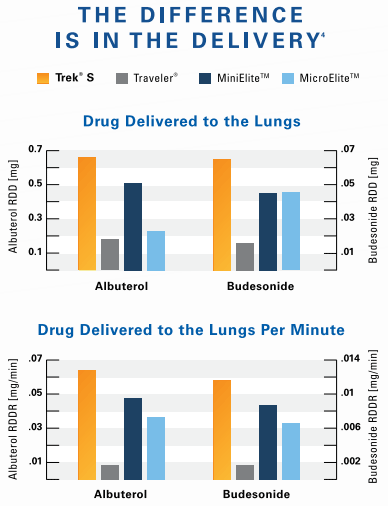 Pari White Paper on Portable Jet Nebulizers – comparative testing results for portable nebulizers. Pari Trek S Brochure provides features, benefits and components information. 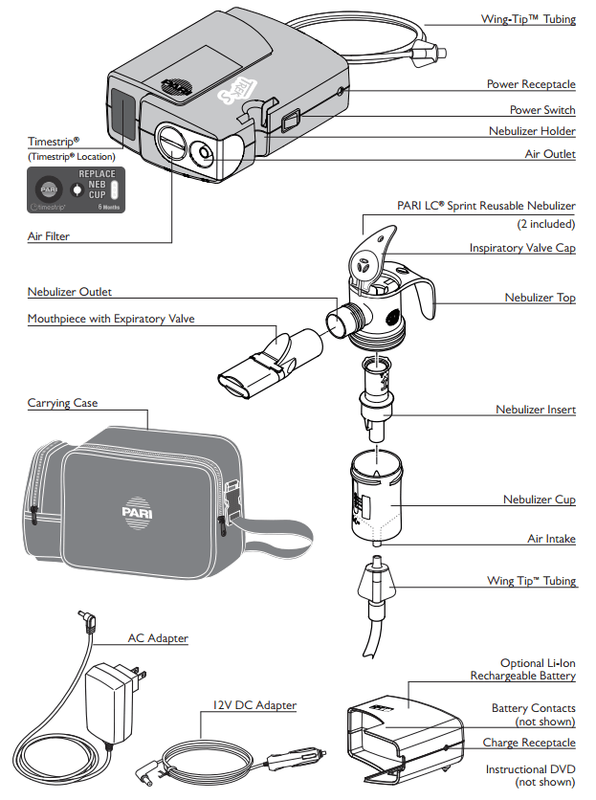 Trek S Nebulizer Instructions offers setup, maintenance, warranty and specification information in English and Spanish. 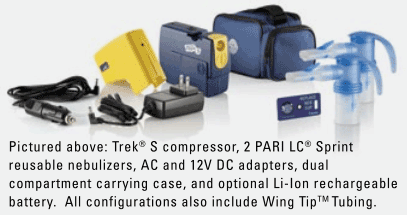 Do you need a prescription to purchase the Pari-trek compressor kit? This item does not need a prescription for purchasing. What is the battery price for the paritrek s compact nebulizer compressor? If you are replacing a battery for a deluxe unit, feel free to call in for current pricing; however, if you are trying to upgrade from a standard unit, purchasing a battery will not work, as the two machines are designed differently. The battery is currently on a manufacturer back order. Please check back periodically for updated information regarding this item's availability. Can you submit insurance info to pay for nebulizers? Can I use a different nebulizer? If you want to replace your hose everytime you use this nebulizer than this is the nebulizer for you. Since the heat exhausts through the hose it either melts the hose to the machine or melts/expands the hose so it will not stay on the nebulizer. I already had one machine replaced because it was stuck together. Now i have to hot glue the hose down so I'm not stuck holding the machine and hose together while trying to hold the actuator between my teeth. You can not relax and use this machine. Its frustrating as hell. It also only holds 2 charges and does not provide me peace of mine when I travel, which is the main reason I wasted my money on this product. $120 at the time, total bull$%*^! Nebulizer works wonderfully! So compact and lightweight in an awesome carry case. Could easily travel with this nebulizer. SUPER fast shipping as well! I ordered on a Sunday before the holiday - paid for 1-2 day shipping but actually took 3-4 days but it was worth it. contacted customer service and he was courteous and professional . I needed a smaller nebulizer that would fit in my backpack to take to school. This one fits the bill. It is small and lightweight, has its own carrying case and works as well as my larger nebulizer. Shipping was lightning fast. This is an excellent product, just what we were looking for when traveling. This unit is ultra compact, includes both AC/DC power adapters. Great for taking in the car for road trips or at home. Love that it's small and that it works well - of course not as fast as my larger machine at home but it's 1/3 the size so you can't expect the same power. Shipped fast, in original packaging. This is my 3rd Trek from this company. I travel a lot, so they get used a lot and therefore, get slower more quickly. Will purchase another one when this one started to die. This.machine works well. I did not buy the battery as i will only be in the car or a hotel. It's not as fast as my full size machine, but works better than the ultrasonic I tried first. I was given one of these by my doctor's office to use and the day, the seller quoted me a price of $179! I found this one your website and promptly was helped by a very nice lady! I had it in two or three days! Thank you! 5 stars to Vitality, sales representative and product. I just received my new machine but would thus far give it 5 stars for performance and ease to use. I need it for travel both when I ride short or long distances. The company Vitality was so fast and efficient I would highly recommend them to anyone with respiratory issues. Thank you!